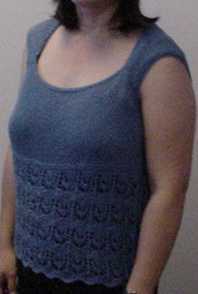 I got my friend at work to take a pic of me wearing my LBT today in all it's finished & blocked glory. Indoor lighting and old work digi cams leave much to be desired, but it'll do. I've got a black ON layering tank underneath to make it work appropriate as well as a black blazer since the SF Bay Area fog makes the mornings very cool. I'm happy with the way it turned out though I will need one of those demi-type bras so I don't keep fiddling w/the straps all the time as they want to peek out ever so slightly right were the seams joining the front to the shoulders are. I'm glad I joined this KAL and it helped keep me motivated to finish this project and all your tips and suggestions helped me immeasureably. Thank you all and knit on! edited to add: original finished post w/yarn specs can be found here. Love it!! Congratulations. Your yarn looks so cozy. Did you use the recommended yarn or something different? Awesome! Very nice work in a very flattering color for your dark hair! Well done. It fits you perfectly and another lovely colour! yes! it looks terrific on. I agree about the bra straps. The shoulders hide them ONLY if you don't bend, turn, breathe, etc. At the same time, I really like the way the neckline is shaped, so I guess that's the trade-off.